GOODYEAR, Ariz. (AP) The Cleveland Indians were waiting for the right time to turn Cory Kluber loose in spring inning. Kluber made his first Cactus League start Monday, pitching 3 2/3 innings against Cincinnati and giving up three runs and six hits, including a homer by Yasiel Puig. Indians manager Terry Francona wanted to limit the intensity for Kluber as he was building his pitch count in a controlled environment. The plan was for Kluber to pitch in intrasquad games and live batting practice to build to 50 pitches before launching him into game experience. The two-time Cy Young award said he kept under control. "It is different from pitching on the back fields for sure," Kluber said. "You have the scoreboard and the fans that give you the extra little kick of adrenaline. That's the reason we, I don't want to say slow play it, but we wait until now to control the intensity a bit." The Indians have held Kluber out of games early in the spring since 2017, the year after Kluber pitched deep into the World Series. "One of the goals is to stay with your delivery by controlling the adrenaline to work on things," Kluber said. "If you have things to work on delivery-wise, or pitch-wise, it is a lot easier to work on them when you control the setting. You are going to pitch over 100 innings in the regular season, so 10 innings on the back field is not going to make much difference." Kluber, who turns 33 next month, posted a career-high 20 wins last year and had a 2.89 ERA while pitching an AL-high 215 innings. Yet the three-time All-Star was rumored to be in trade talks between the Indians and Reds over the winter. He is signed through 2019 with team options for 2020 and 2021. "Everybody in our group is trying to get better," Kluber said. "Nobody is really content where we are." Mike Clevinger, who went 13-8 last year, followed Kluber on Monday. 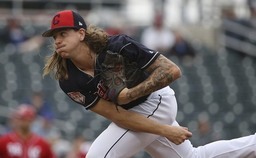 Clevinger allowed two runs in 2 2/3 innings while striking out five in the 5-5 tie. "It is exciting to get Kluber out there," Francona said. "The idea was to have Clev follow Kluber but stay in his routine. Do his long toss at the complex with walkie-talkies and everything we can bring him to the park. If we ran into any problems we could fill in an inning." NOTES: The Indians optioned INF Yu Chang and RHPs Jerry Rodriguez and Ben Taylor to Triple-A Columbus. They reassigned OF Mike Papi and RHPs James Hoyt, Brooks Pounders and Asher Wojciechowski to minor league camp.